Sonic The Hedgehog © 1991 Sega Enterprises, Limited. 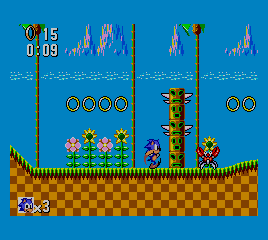 Sonic the Hedgehog for Master System was released on October 25, 1991 in North America and Europe. In addition to its cartridge release, it was built into some versions of the Master System II in Europe. The version that came built-in the Master System II console lacks credits. Because ROM chips were very expensive at the time, the credits were dropped to make room on the small ROM chip for the necessary BIOS routines for the console. By doing this, Sega avoided having to buy bigger and more expensive ROM chips for the console. This was the last game released for the Sega Master System in North America. The Bridge Zone music theme was certainly inspired by Jesse Frederick & Bennett Salvay's song; Everywhere You Look (1987).